Originally published in 1973. Folk-life and folk-culture, usually the preserve of the scholar, have been brought vividly and entertainingly to life in these recollections and stories of one man’s life in the Irish countryside. This book tells the life story of John Maguire, who died in 1975, including over 50 of the songs he sang, with full musical transcriptions. He was a fine singer, firmly within the Irish tradition, and his songs are the record of a people, their history and traditions, their joys and sufferings, their comedies and tragedies. 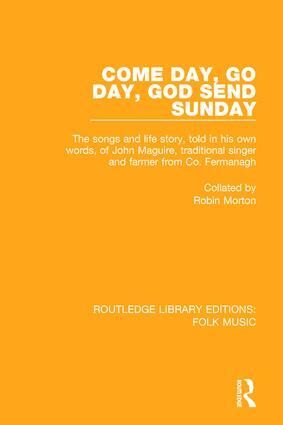 John Maguire’s fascinating story, skilfully and unobtrusively collated by Robin Morton, is full of material that will interest singers and students of folksongs. His songs and music will be of value to all those interested in traditional music and song.